Owners of Zelda Breath of The Wild will be getting a new outfit as part of a Xenoblace Chronicles 2 cross promotion. It’s called Rex’s Costume, and as the name implies, it’s similar to what the protagonist of XC2 wears. It will give Link a slight steampunk vibe, and it’s a nice fit for the new Hyrule. The info was revealed in today’s Nintendo Direct video, a sixteen-minute look at the upcoming open world RPG. It’s got a lot of juicy bits about Xenoblade, so you should have a look if you’re interested. Either way, the video reveals that Zelda BoTW will be getting a new side quest on November 9th. Once you finish it, you’ll get Rex’s Costume, a new armor set based on what the protagonist of Xenoblade Chronicles 2 wears. And that’s pretty much it. The video doesn’t mention whether it’s a time limited offer, so we suggest you grab it as soon as possible. If you delay and it gets taken off the table, you’ll definitely regret it. There’s also no word on the set’s stats, and whether it actually does anything beside looking cool. The quest will probably be added to your journal automatically after the imminent update, gently nudging you towards the shiny new outfit. In case that doesn’t happen, we’ll be sure to write a guide showing you how to get Rex’s Costume, so you don’t miss out. 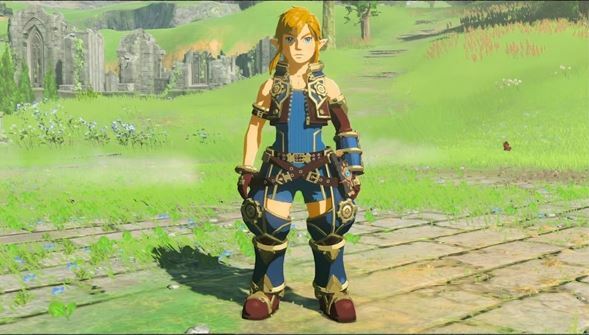 This will be the first time Link gets new clothes since the relese of the Master Trials DLC, which added some fabulous garments, like Tingle’s Outfit and Majora’s Mask. Another DLC is planned for the holiday season, and we’re hoping it brings us even more outfits and costumes. A Mario suit would be nice, complete with moustache. We’d even settle for Green Mario.